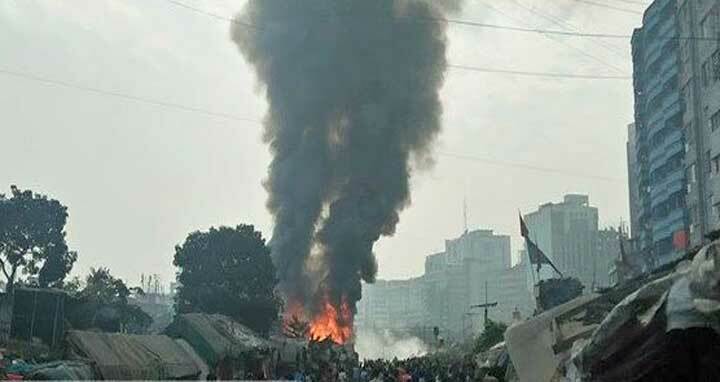 Dhaka, 1 Jan, Abnews: Fire fighters have brought the fire under control after it broke out in a slum near the railway track of the capital’s Karwan Bazar area on Monday noon. According to Fire official, nine firefighting units rushed to the spot and brought the fire under control at around 1:20 pm. Devasish Bardhan, deputy director of Dhaka fire service, they are conducting rescue work after brining the fire under control. Around hundred shanties have been burnt down, but no one was injured. The cause of the blaze and the extent of losses are not known immediately.